StructureScan Mini XT handheld GPR. New technology to be featured includes the StructureScan Mini XT handheld GPR, as well as a 3D module for GSSI’s SIR 4000 GPR control unit, which features numerous updates that support next-generation digital capabilities. GSSI experts will be highlighting the new StructureScan Mini XT handheld GPR, the latest addition to the industry standard StructureScan all-in-one GPR system. 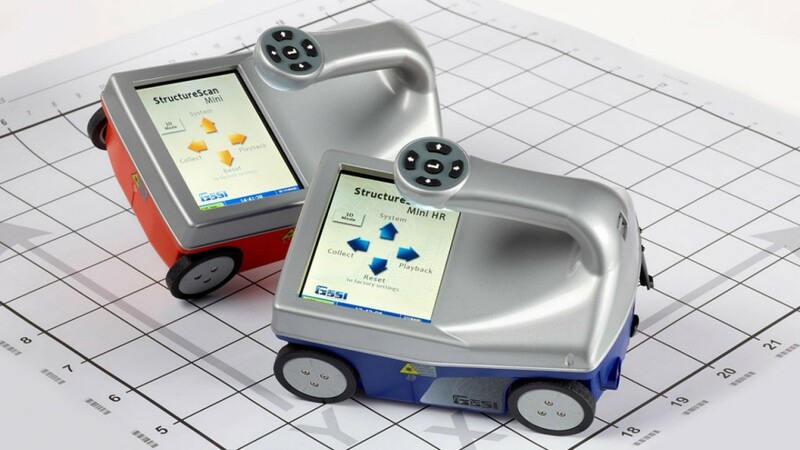 Ideal for locating rebar, conduits, post-tension cables and voids, the StructureScan Mini is also used for real time determination of concrete slab thickness. Its compact design has long made the StructureScan Mini a favorite among concrete inspection professionals, especially in tight spaces or overhead survey locations. The newest model features a friendly user interface and several new data collection modes. Additionally, the redesigned model is IP 65 rated to withstand the jobsite’s toughest conditions. Also on display will be the standard StructureScan Mini, whose 1600 MHz antenna can reach depths of up to 50 centimetres (20 inches). All the StructureScan Mini systems safely locate metallic and non-metallic targets, with an auto target feature that marks the features of interest. The systems are available with standard 2D capabilities, or with 3D capabilities for an x-ray-like image. The units’ ruggedized plastic casing and wheels ensure long-lasting performance. The updated SIR 4000 GPR control unit on display features a variety of updates, including a new 3D functionality for Expert Mode that promises to revolutionize how three-dimensional GPR data is visualized, while simplifying an often complicated process. The controller’s innovative technology is compatible with both GSSI’s traditional analogue antennas and newest digital offerings, resulting in the versatility and flexibility needed to support a wide range of users and applications. The SIR 4000 updates also brings the StructureScan 2D and 3D collection modes to the controller, streamlining its use for the concrete construction industry. The module includes high frequency antenna-specific setups to ensure survey efficiency, and enables the controller to automatically recognize smart antenna setups. The updates also include an on-the-fly automatic gain option to better enhance the data display, while still saving the file in the original raw format for post processing. Also included is a horizontal zoom function that helps resolve smaller targets, and a “Save Image” shortcut for quick reports. The updated SIR 4000 provides a 10.4-inch high definition display, a simple user interface, plug-and-play GPS integration, and multiple data transfer options. Designed with a number of exclusive features, the SIR 4000’s casted aluminum chassis offers superior temperature stability and an impact resistant design. The unit delivers a full IP 65 capability, and can withstand tough jobsite conditions. SIR 4000 GPR control unit.